I really like Print Migrator, it makes a time consuming laborious task really easy. It’s so good Microsoft don’t use/support it any more, (after Server 2003). So this week when I was migrating printers from an SBS 2003 server to a clients 2003 CRM server, I was really happy, and dragged out PrintMig. Warning: Kernel Mode Drivers (version 2) are blocked on the target machine. Disable Kernel Mode driver blocking and re-run Printer Migrator. Ignoring this warning (Cancel button) will result in driver installation, but because they are kernel mode drivers – a serious problem with any dependent print queue could potentially bring down the system. Selecting OK will result in a restore termination. 1. 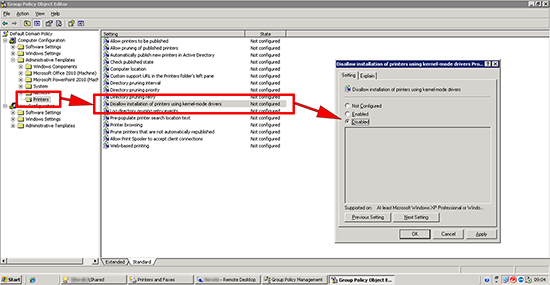 A quick internet search told me to disable the policy within the servers local policy, but Computer Configuration > Administrative Templates > Printers didn’t exist, so I did it in the default domain policy. Set the policy to Disabled > Apply > OK > Close the policy editor. If there is no sub-key called Printers > Create one. 2. 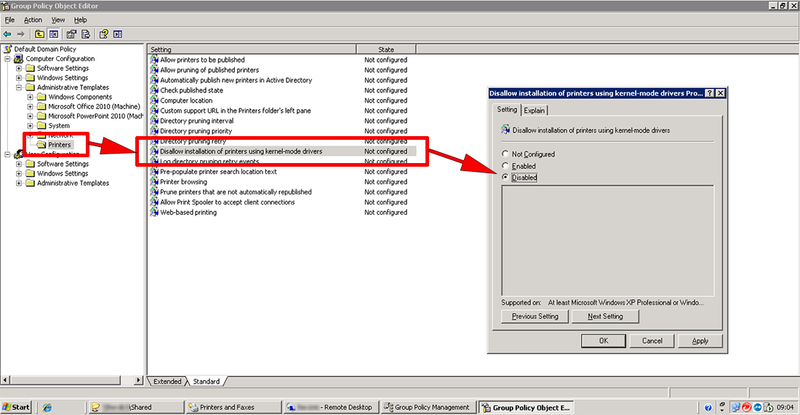 Within the Printers Key create a new DWORD called KMPrintersAreBlocked and set its value to 1. 3. Run the PrintMig restore process again.